Jesse Wiggins of Cullman, Ala., takes the lead on the second day of the Bassmaster Elite at Cherokee Lake bringing a two-day total weight of 35 pounds, 15 ounces to the scales. KNOXVILLE/JEFFERSON COUNTY, Tenn. — With the Bassmaster Elite at Cherokee Lake having reached its halfway point, a trio of Elite Series newcomers are sitting atop the standings with a chance to make their mark on the trail very early in the season. Jesse Wiggins of Cullman, Ala., came to eastern Tennessee this week, having already won two Bass Pro Shops Bassmaster Opens in the past 10 months. Now, after catching 35 pounds, 15 ounces the first two days, Wiggins is leading his first-ever Elite Series event with a 1-6 advantage over Indiana pro Jacob Wheeler — a newcomer to the Elite Series who doesn’t qualify as a rookie because of his past career earnings on other trails. Wiggins has relied on one incredible spot the first two days — and probably hasn’t spent more than three hours fishing it in 16 total hours of competition. The place is easy enough to guard, considering how small it is. Wiggins said he had a tough time locating fish in practice because the lake is so full of rocks, and it can sometimes be hard to differentiate between fish and rocks on his depthfinder. But his magic spot has nothing but a clay bottom, and that makes the fish easy to see. Wheeler began the day on a sour note, realizing he had lost about half of the waypoints he marked during practice on Cherokee because of a glitch in his GPS system. But once he moved past the shock, he managed to find enough of his good spots to catch 16-15. Wheeler said he benefitted greatly from “sneak holes” — inconspicuous areas that were being overlooked by many anglers. “I’m not just fishing points or flats or big areas,” Wheeler said. “I’m fishing little subtle places on those bigger areas where, if you find fish, you’re going to get bit. 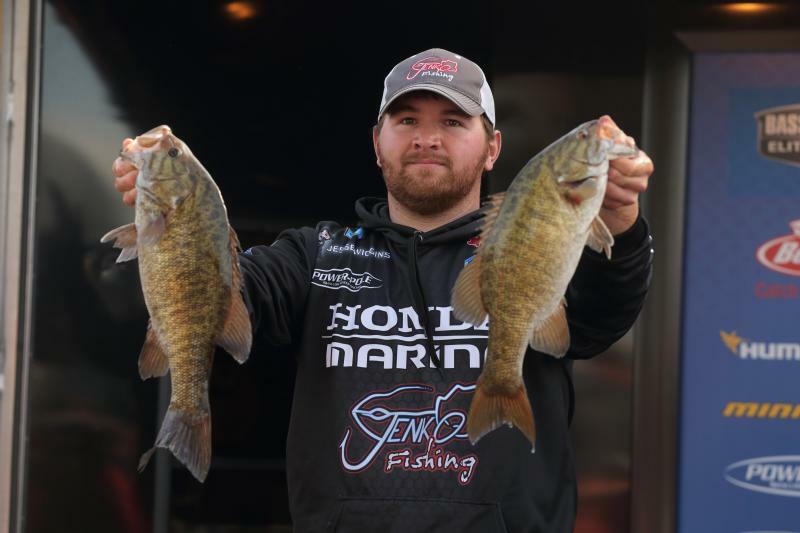 Jamie Hartman of Newport, N.Y., who is designated an Elite Series rookie, has a lot of experience fishing for smallmouth bass. Many people assumed he would feel right at home fishing deep water for smallies this week. He said that hasn’t been the case. So why has he been able to catch 17-10 and 16-13 the first two days? Minnesota angler Seth Feider is in fourth place with 33-11, and Tennessee pro David Mullins is fifth with 33-10. The tournament will resume at 7:15 a.m. ET Saturday with the Top 51 remaining anglers taking off from Cherokee Lake Dam and TVA Boat Ramp. The weigh-in will be held at the Knoxville Convention Center at 4 p.m. The field will be trimmed to the Top 12 after Saturday’s round, with those anglers vying for the $100,000 first-place prize Sunday.